Home » Politics » #BiharPolls: have Modi and Amit Shah lost the plot? 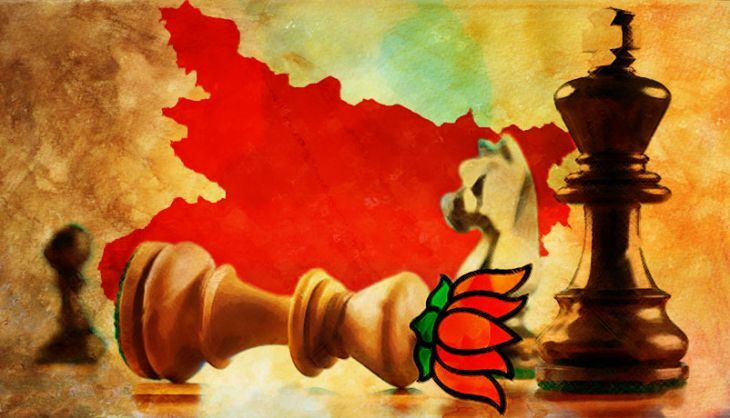 Does BJP even have a coherent strategy in Bihar? Is Amit Shah responsible for BJP\'s under-performance in the first 2 phases? Straws in the wind suggest that things are not going smoothly for the BJP in the Bihar assembly elections. Also read - The great PR heist: did Amit Shah really scold the BJP hotheads? Among political observers in Patna, there is a perception that the first two phases of polling have given an edge to the "Maha-gathbandhan" or the Grand Alliance of the Janata Dal (United), Rashtriya Janata Dal and the Congress. In the third phase of polling, the BJP is expected to be at an advantage in urban areas, but the presence of a number of rural constituencies in this phase could neutralise that advantage. Even if the Grand Alliance wins only half the seats in this phase which includes Patna and its surrounding areas, it could be home and dry. This is because in the fourth phase there are constituencies with a large proportion of EBCs (Extremely Backward Castes) who never vote en bloc. While some of them, like the Kushwahas may go with the BJP-led coalition, a substantial section could also opt for Nitish Kumar. It was Kumar who gave them a special quota within the overall provision of OBC reservations. The fifth phase constituencies have a large Muslim vote. That is expected go en masse to the Grand Alliance. If this logic is correct, then it is difficult to see how the BJP can hope to form the next government in Patna. Although Bihar is nearly half-way through the polling process, the BJP still seems unsure of its campaign strategy. Consider some of the inexplicable turnarounds the BJP has made in this election. As a wag put it, "Chai par charcha became Gai par charcha," referring to the party's switch from a focus on inclusive development to beef. This was an obvious bid to divide the Yadav votes, and Narendra Modi eulogised the relationship of the "Yaduvanshis" with the cow, and targeted Lalu Prasad Yadav for a statement on beef eating by Hindus. What the BJP forgot was that cow-slaughter has been illegal in Bihar since 1955. "When it comes to choosing between religion and caste, in Bihar caste is preferred. So stirring the beef pot did not help," said the editor of national daily in Patna. After the second phase of polling, the party is back to campaigning on a development plank. Here, the BJP has to contend with the sterling record of Nitish Kumar. Talking up development does not necessarily give the BJP an obvious advantage over the Grand Alliance. The BJP has also mishandled the issue of caste-based reservations. RSS Chief Mohan Bhagwat's statements suggesting a review of the reservations system has substantially damaged the BJP's chances. In an economy where opportunities in education and employment are already quite limited, the backward castes see reservations as their only avenue of upward social mobility. Anyone who threatens to block or constrict that path of advancement is bound to be opposed. Surprisingly, Modi's oratorical skills seem to be bringing in diminishing returns to the BJP in Bihar. People see him as someone who talks tall but delivers little. "He talked about his achievements in Gujarat to the rest of India. Then he talked about his achievements in India to the rest of the world. But in India we haven't seen much achievement in the 16 months of his rule. At this rate, it is hard to believe his claims on Gujarat also. Then when he comes to Bihar and promises that he will do this or that us, people are naturally skeptical," said a Patna resident. Another said, "He should not have got his speeches abroad telecast in India because they make everyone feel that addressing a crowd is only a tamasha for him. These tamashas don't necessarily convert into votes." Perhaps it was this realisation that led to the cancellation of some rallies by Modi. However, it is a measure of the BJP's desperation that when it found that the perception was that the BJP had accepted defeat and did not want the blame to stick to the prime minister, it immediately announced that the number of election rallies addressed by Modi would be increased. Not projecting a local leader as their potential chief minister has also worked against the BJP. The decision itself was understandable, as the BJP does not have a local leader of the stature of Nitish Kumar or a substantial mass base. Perhaps it had no option but to pit the Prime Minister against Nitish Kumar. However the BJP has not been above projecting different candidates in the media for the CM's post depending on the constituency it is aiming at in each phase. First, it projected Prem Kumar to appeal to the Mahadalits. Then it hinted that Rameshwar Chaurasia would its chief ministerial candidate when the party thought he was falling behind in his constituency and it thought this might consolidate the EBC vote behind him. Then, Rajendra Singh, a Thakur, was projected as BJP's future chief minister. "At this rate, they will declare CP Thakur, a Bhumihar, their chief minister in the third phase which includes Patna and by the time we reach the fifth phase of polling, it will be Shahnawaz Hussain to try and entice Muslim voters," a politically astute Patna resident commented. The BJP also seems to have over-estimated the extent to which urban youth is committed to Modi, cutting across political lines. This may be true of a section of the youth in the urban areas but in general, caste seems to trump other aspirational discourses in Bihar. At Patna College when the proposition that youth was not caste conscious was put to some students, this reporter was given arguments in favour of caste-based voting. "When those in power favour only people of their caste, why should we not vote for a candidate or party of our caste?" asked one of them. "In an ideal situation, caste or community would not matter .But how can you have leaders who are openly casteist and then ask us to give up caste-based political loyalties? How do we gain from that?" another asked. A sub-theme in the BJP's campaign is fear of the "jungle raj" alluding to lawlessness during Lalu Prasad's tenure as chief minister. However that was more than ten years ago and Bihar under Nitish Kumar has enjoyed greater public confidence on law and order issues. Lastly, the larger than life presence of BJP president Amit Shah has not added to the BJP's campaign. Shah's arrogance has alienated not only some of his party men, to whom he is known to talk rudely, but also large sections of the media. In his press interactions, he questions the "intentions" of journalists who ask him uncomfortable questions, engages in arguments with them. Bihar's journalists are not the sort to take kindly to bullying tactics. It remains to be seen though how the Bihar voters react to both Modi and Shah - for the duo has somehow converted this election into one about their apocryphal campaign and election management abilities.